Home News What is “New Mobility” Anyway? Making sense of MaaS, MOD, IoM, and how we got here. In 2018 it seems that every conference involving transportation, smart cities, parking, the Internet of Things, and technology as a whole has included at least one session on Mobility as a Service or “MaaS”. This is a relatively new and poorly understood concept here in North America, and there is a fair amount of inaccurate information being circulated amongst those in the industry. Anyone in a position of authority are — willingly or not — entering into a dialogue where we are expected to be an instant expert. We may then find ourselves restating talking points heard or read elsewhere. The fact is, Mobility as a Service — as well as many “new mobility” concepts — represents new territory for most practitioners, even those with a 40 year service history. The most widely cited definition for Mobility as a Service (MaaS) comes from the European MaaS Alliance, which defines the concept as “the integration of various forms of transport services into a single mobility service accessible on demand.” By this definition MaaS can look a number of ways and include many different features, such as a unified mobile app, multimodal journey planning, service bundles, a fixed monthly subscription, or pay-as-you-go billing. But the single unifying feature of any MaaS implementation is the integration of multiple services, thereby providing a more compelling alternative to driving your own car than any one service would be if offered on its own. MaaS cannot exist without a multitude of mobility services to be integrated. Ride hailing, ride sharing, car share, bike share, and microtransit, have all seen massive growth in recent years, particularly in dense urban areas. But without meaningful multi-modal integration with fixed-route public transit and other services, these “new mobility services” (NMS) are not themselves MaaS. Transportation Demand Management (TDM) is the field by which most U.S cities and public transit agencies have long been tinkering with these concepts, mostly by exploring service offerings and incentives to get commuters out of their own single-occupancy vehicles. There are well documented strategies of pilots and programs that introduce recent deployments as well as services that have been operating for decades utilizing TDM strategies. Many agencies employ “Mobility Managers” that attend community fairs and events to educate the public on commute alternatives. The field of Mobility Management, which seeks to provide congestion mitigation and viable alternatives for non-drivers is an important part of any transportation ecosystem. It is not, however, MaaS. It may be more accurately referred to as a precursor to MaaS, along side the advent of new technologies and service models. Mobility on Demand (MOD) is a concept by which personal mobility can be accessed through a service that does not require a reservation in advance. This could be by mobile application, or through a system of call centers and transportation providers. 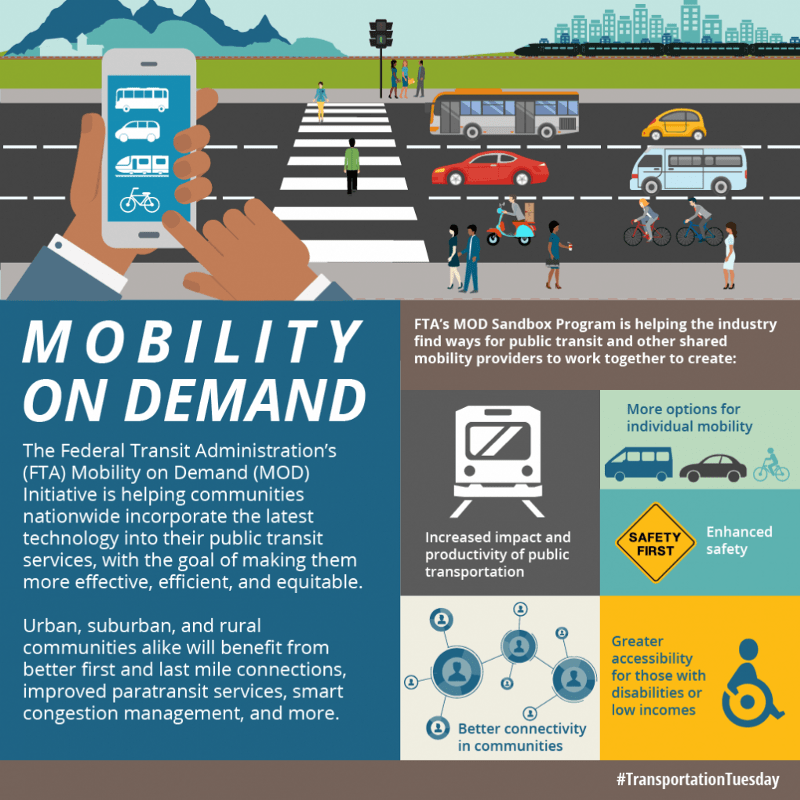 MOD is more familiar to most American transit agencies through the work of the Shared Use Mobility Center and the Federal Transit Administration’s MOD Sandbox program. But make no mistake, MOD is also not MaaS. A successful MOD system is likely to depend on MaaS-like integrations, but MOD may also refer to the movement of goods and services on-demand. Ultimately, MOD helps us to imagine what MaaS can look like when implemented, but they are separate pieces of the overall puzzle. The latest evolution in the new mobility framework is the concept of an “Internet of Mobility” (IoM), a theoretical open protocol structure to enable MaaS integration for all users and mobility service providers anywhere in the world. Much like standards such as HTTP, IP, DNS and IMAP enabled the World Wide Web to function across international borders and proprietary web browsers, IoM protocols would create massive new opportunities for transportation service providers, current and potential customers, and mobility aggregators. The IoM approach to MaaS is slowly gaining traction across the sector, from advocates and think-tanks like ERTICO and the TravelSpirit Foundation to blockchain-building startups like TSio and IoMoB. Whether it takes the form of a single app serving one city at a time or as an integrated marketplace for mobility services around the world, MaaS is coming to to our cities and towns. The MaaS Alliance website features a mapof areas around the world where MaaS projects are already taking place, including here in North America. Having defined the key terms and acronyms, it becomes easier to see how these concepts fit together. For instance, a transit partnerships with Lyft™ and Uber™ that provides local connections to and from transit stations would be an example of MOD. A community outreach event about the partnership hosted by the local Transit Management Association (TMA) would be considered TDM. An app that allows users to cover both the transit fare and cost of the ride to the transit station with a single payment would be an example of MaaS. Together, these overlapping concepts mean big changes for governments, transit agencies, car companies, and consumers alike. This is where the term “New Mobility” comes from. Consider it the marriage of technology, services, public-private partnerships, and consumer preferences to increase the capabilities of the overall transportation ecosystem. The New Mobility network includes fixed route, deviated schedule, on demand, subscription based, multi-passenger, single occupant, shared use, public operated, private operated, semi-autonomous, fully autonomous, public bike share, dockless bike share, e-bikes, bike parking, EV charging, loading zones, walkways, and so much more. MaaS is the framework by which we can enable viable, multi-modal journeys utilizing current and future technologies and services, which include but are not limited to NMS and MOD services as a way of addressing TDM goals. Crissy Ditmore is an Ambassador for Mobility as a Service and a strategist for cities of the future. She is a founding member of the Coalition for Smarter Transportation and TravelSpirit Foundation North America. Jeremy Dalton is a transportation and technology strategist based in Portland, Oregon. Jeremy is a Principal consultant at Method City, Chief Technology Officer for the TravelSpirit Foundation, and Co-chair of TravelSpirit North America. NMS — New Mobility Services: Public and private transportation services, mostly available on-demand, made possible by mobile technology and real-time location data, including ride hailing, rideshare, car share, bike share, and microtransit. ¹ Definition based on language from the TravelSpirit Foundation. ² Abbreviated definition based on language from the MaaS Alliance. ³ Definition based on language from USDOT Mobility on Demand Initiative. ⁴ Definition based on language from Mobility Lab. ⁵ Definition based on language from ACT TMA Handbook.